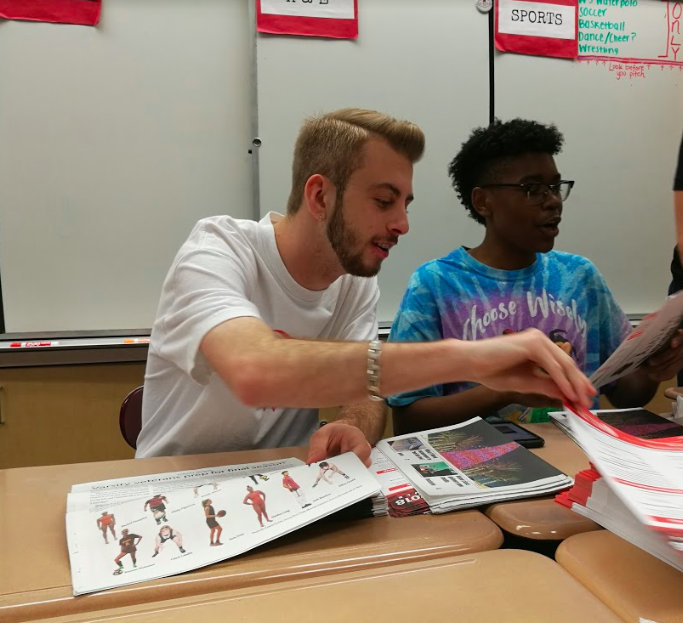 Seniors Kyle Pearce and Daniel Wilder help stuff ads into The Aztlan newspaper for IMJ class. Every time the newspaper are released, students enjoy donuts as they prepare paper. As soon as you enter, you realize this isn’t a typical classroom. It’s a Newsroom. There are no traditional rows of seats. Instead desks are arranged in horseshoe where students can easily talk about campus events. Old meets new with Apple computers and vintage typewriters lining the walls. Before class, students lounge on a futon drinking freshly brewed coffee. Just like the vibe of the room, Intro. to Multimedia Journalism (IMJ) is a class that is different than other fine arts electives. In the class, students learn how to communicate information to a mass audience through writing, photography and design. He joined the class because he has an interest in music journalism and hopes to be on a radio show when he is older. Senior Rylee Allen enrolled because she wanted to join a class that focused on writing. Allen described the class as “real world writing” learning skills you wouldn’t in another class. “A typical day consists of working on an article in class or taking notes. The workload is pretty light and you work in class,” said Allen. Allen discussed how a student who joins can strengthen their writing skills and people skills by interviewing. Junior Anna Koclanakis said “someone who enjoys writing and is open minded,” should join IMJ. She said that the class is good for language arts and it helps her keep up with current events. The class has made Koclanakis more aware with the world and on campus. She described that everyday in class is different and interesting. Though current events help navigate the class, the foundation of journalism and basic sections of a newspaper are taught. “I saw it as an opportunity to develop a new talent, and maybe even a career opportunity,” said junior Karem Trindade. Trindade enjoys the class because she learned how to communicate better with people. She also likes how the class is independent work. “It has taught me that being an informed citizen is really important and it correlates to what you write,” said Trindade. After being in the class for a semester and meeting qualifications, a student can join The Aztlán staff. A student will still be in IMJ to learn how to vary their writing style, but will also be in Advanced Multimedia Journalism as an independent study class in zero or seventh period. Trindade’s transition from enrolling in newspaper was described as a way to feel more responsible. “What you do affects the work of others,” she explained. She has learned how to balance the pressure of getting interviews and writing on time. “What is good about being a member of the paper is that you can really do something for the school, for the students and for the teachers,” said Wu.